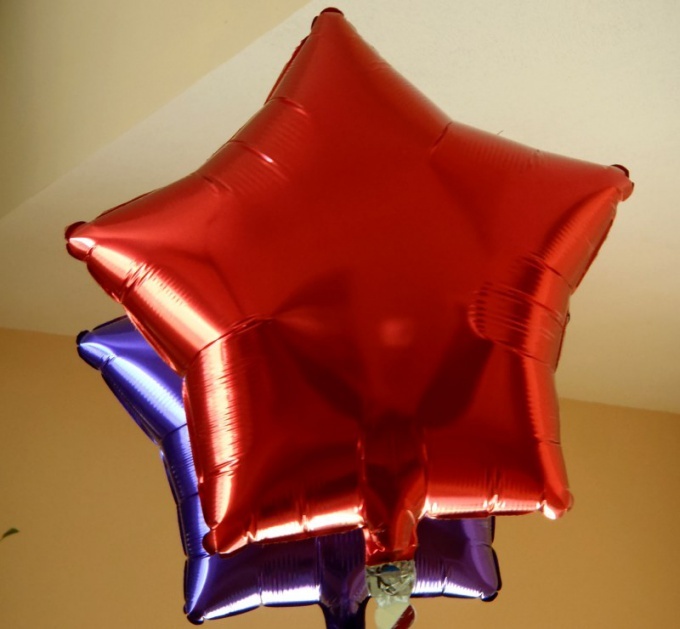 Voluminous shiny star – a great Christmas decoration. It can be hung on a wall or ledge. If you attach the cardboard tube, star can be worn on the top of the tree. To make such a decoration is possible in several ways. Single layer thin foil DIY in this case is not necessary, as, indeed, and food. This material is too easily wrinkled. Fit foil on paper basis, which can sometimes be found in stationery stores or where you sell goods for artists. Paper layer of the foil to wrinkle, so this material holds good shape. You will also need PVA glue or double-sided tape, scissors, piece of paper or cardboard for template-ruler. If you do not find in the store foil, paper backed, can buy and subtle, but then will need another piece of paper or cardboard. Star surround is glued of five identical rhombuses. Draw a diamond shape on the cardboard. Circle it on the paper side of the foil, leaving a margin of 1 cm on each side. Cut 10 diamond shapes. If you are going to put the star on the tree, you need another tube, and such that you can paste between the two halves of the star. It can be from the same roll of foil and flatten one end. The star consists of two halves. Each diamond fold in half along the long diagonal of the paper inward, smoothen the crease, and then unfold the diamond. Fold the allowances on paper side. Mark both blanks sharp corners. It will be the center of the star. Side adjacent to these angles, glue together with white glue or double sided sticky tape. Glue the third diamond, fourth and fifth. In the same way assemble in the second half. Glue the halves, putting between them a tube with the flat side inside the star. Three-dimensional star can be made from thin foil. It will take some more time but the result will not be worse. Place foil sheets on drawing paper or thin cardboard. Double sided tape in this case is not very suitable, because it is badly bent. Wait until the material dries, and then make the star on the same technology as in the first case, that is, cut 10 diamond shapes, fold them, glue the halves, and then a star. You can first make a star from paper, and then paste over it with the foil. This method is good if the star itself is done in papier-mache and glued, for example, with foil. Make a star out of clay. Lubricate it with petroleum jelly or a greasy cream. The first layer is made of napkin glued to the water. The other layers are put on the paste or PVA glue. When the star is ready, cut it into 2 halves, remove the plasticine and glue. Glue your piece of foil. There is another option – first primed with the product latex paint, and then cover with silver or bronzovoi.